Each environment has four levels, all with the same objective: play hide-and-seek with five animals! Just tap the animal if you spot it, or tap the character’s icon on the right panel for a hint. Once found, each animal does a trick across the screen to its own special instrumental sound. Once all the animals are found, you’ll be able to see a little mini-movie; finish all the levels, and see a super-powered one! Each level has its own array of hiding spots, sounds, and tricks. Even for a child’s game app, Animal Hide & Seek Adventure sports a fantastic grasp of graphics and sound. There’s just enough of both to be fun and exciting–not garish or annoying–and each level exhibits something very different from the last. If all games could have as much careful, thougtful planning as this one did, we’d all be much better for it. All the animals are cute and enjoyable to watch, and levels are short enough to keep a child’s attention. It’s well worth the $1.99, but there’s a Lite version for free (with only the four Jungle levels) to test out if you’re being cost-conscious. 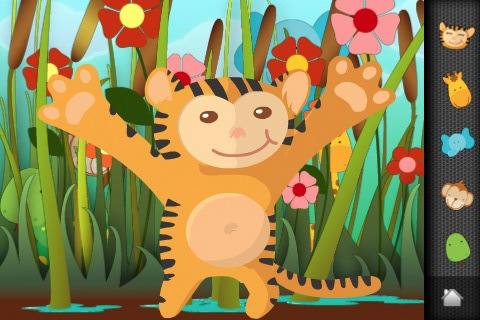 AppSafari review of Animal Hide & Seek Adventure was written by Julie Guan on April 14th, 2010 and categorized under Adventure, App Store, Fun, Games, Mini Games, Puzzler. Page viewed 4381 times, 1 so far today. Need help on using these apps? Please read the Help Page.